Culturally responsive pedagogy can be a game-changer in a school’s pursuit of educational equity. But! There are misconceptions about what culturally responsive pedagogy is and how it works. CRT is more than just a set of multicultural activities, social justice lessons, or kinesthetic learning strategies. It’s so much more. Our workshops are designed to create foundational readiness to build a culturally responsive classroom, lead a culturally responsive school, or coach teachers toward greater responsiveness. Each covers the mindsets, moves, and capacities necessary to effectively be culturally responsive in ways that changes student outcomes over time. It is important to note: These are not “train the trainer” workshops unless indicated. 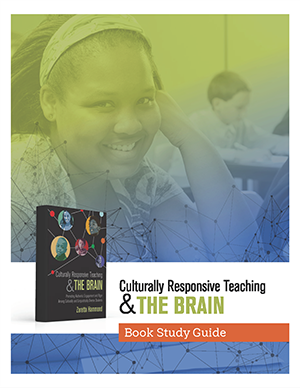 While not required, participants are strongly encouraged to have read Culturally Responsive Teaching & The Brain (Corwin, 2015) prior to the workshop. WHO SHOULD ATTEND: Educators K-12, leaders, and instructional coaches. Culturally responsive education is the next evolutionary step on the path to educational equity? But, what are the basics of culturally responsive pedagogy? What distinguishes the Ready for Rigor approach from other equity efforts like cultural proficiency or social justice pedagogy? How can I start incorporating cultural responsive practices now using this model? This 2-day training focuses on helping educators put in place foundational practices that set the stage for successful implementation of culturally responsive teaching and learning. WHO SHOULD ATTEND: Teachers, counselors, and others responsible for school climate and well-being. Neuroscience findings confirm the need for social-emotional learning and development for both teachers and students. Is our current approach to social-emotional learning and development inclusive? Is it biased? How do we provide social-emotional development in ways that are culturally responsive? This 1-day training looks specifically at SEL practices that foster students’ academic mindset. We will examine SEL curriculum that complements the Ready for Rigor framework areas of learning partnerships and community of learners. It will help educators bring a critical lens to current SEL practices. Culturally responsive lesson design is more than just “diversifying” your content to make it more multicultural. Instead, it focuses on developing students’ capacity for deeper learning. What are the building blocks of this type of lesson design? How do I make content more authentically relevant, especially in math and science? We will delve into the tools and processes associated with Information Processing quadrant of the Ready for Rigor frame. You’ll learn the core learning tools that make instruction more culturally responsive. This 1-day training is a “make and take” workshop focused on building lessons that leverage culture as a cognitive scaffold for processing new content. We will also plan for how we get students “ready for rigor” as part of the design process. This is a foundation for all other trainings. WHO SHOULD ATTEND: Instructional coaches. Instructional coaches are a vital linchpin that help translate the leader’s vision into reality when they are able to partner with teachers around culturally responsive practices. This workshop is designed to add new tools to experienced coaches’ repertoire. Focus is on helping teachers shift deficit thinking about student capacity and on implementing learning partnerships. In addition, we will examine how to support teachers to shift their instructional delivery to be more culturally responsive. This workshop covers the same content as the 1-day day. On the second day, we focus on in-depth role play and action planning. We will have an opportunity to explore instructional moves in more comprehensively as well. Got the Book. Now Get the Guide. Don’t miss new workshop announcements! Join the newsletter to stay updated with the latest news. Copyright © Transformative Learning Solutions, All Rights Reserved.